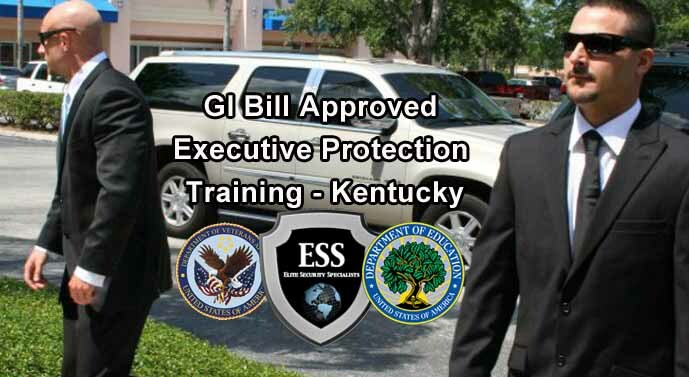 GI Bill Approved Executive Protection Training - Kentucky - Also referred to as Close Protection or Bodyguard training, our course is also D.O.E. Approved. 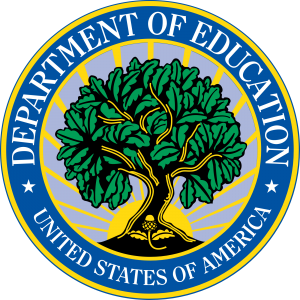 GI Bill Approved Executive Protection Training - Kentucky - VA Approved - D.O.E. Approved - The most relevant close protection training available in the U.S.
And as a leading international security organization, we are totally committed to providing the highest level of quality executive protection training available here at our Tampa campus and around the world. First thing to know - in the security industry, VIP Protection, Executive Protection, Protection Specialist, Close Protection and Bodyguard all are used interchangeably. 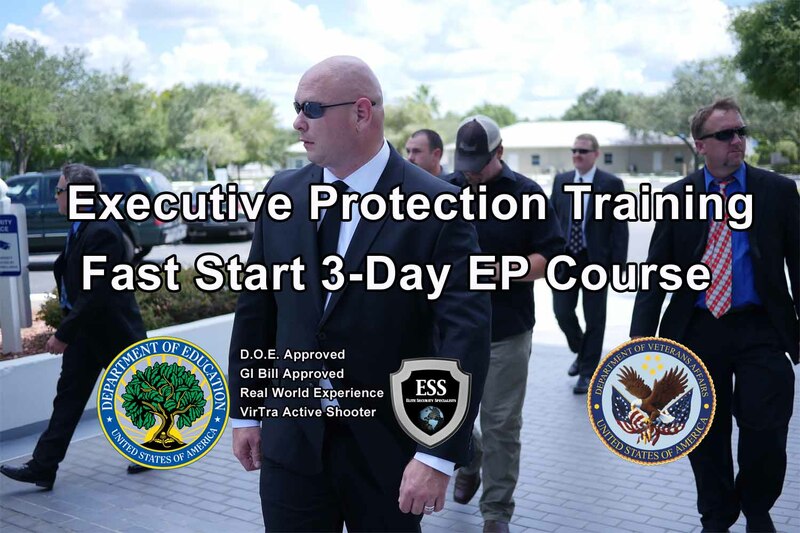 ESS Global Corp offers 2 Executive Protection Classes. There is a Fast Start 3- Day Training that some also use as a refresher course, and a 28-Day MEGA Executive Protection Class for those who are serious about a career in the rapidly growing Close Protection Industry. Our ESS Global Executive Protection Training is designed for career veterans as a "refresher", or a "must-have" for beginners in the world of executive/close protection. This D.O.E. Certified Executive Protection Training gives you a strong start in the security industry covering city, county and state government organizations, corporate security services, security agencies and private individuals. Covering all the basic pillars of executive protection, this 3-day training will provide you with the basic knowledge and protection techniques commonly used by the Secret Service, State Police, Highway Patrols, VIP and Dignitary Protection Units responsible for protecting politicians and other domestic and foreign dignitaries around the world. The ESS Global 28-Day Executive Protection Course is the most realistic, relevant "bodyguard" training available. 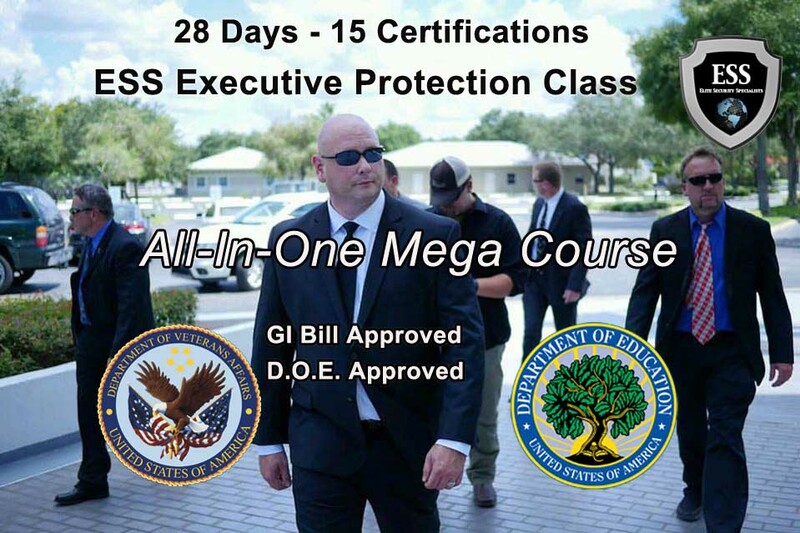 The ESS Global 28-Day Executive Protection "Mega" Course is a series of comprehensive protection training modules developed by ESS Global and approved by both the D.O.E. and the VA.